A recent study by Beat Döbeli Honegger investigated the use of wikis in schools and provided interesting results regarding the stimulative nature of wikis. The study conducted a project to create hypertext on Greek mythology and observed the effects on student learning. A visualisation of the content was done via TouchGraph technology. 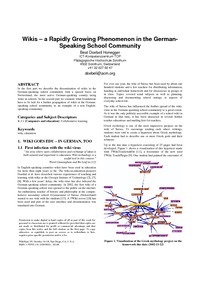 In the first part we describe the dissemination of wikis in the German-speaking school community with a special focus on Switzerland, the most active German-speaking country using wikis in schools. In the second part we examine what foundations have to be laid for a further propagation of wikis in the German-speaking school community as an example of a non English-speaking community.